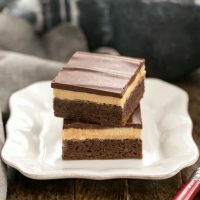 Rich, fudgy brownies topped with peanut butter truffle filling and iced with chocolate ganache! Preheat oven to 350º. Put a long piece of non-stick foil or parchment in the bottom of a 9 x 13 inch pan, fitting so it covers the bottom of pan, the two shorter sides, plus has some overhang on each side for easy removal. If using foil, spray non covered sides of pan with nonstick spray. If using parchment, spray entire inner surface of pan with nonstick spray. While the filling is cooling, make ganache by melting the chocolate chips, butter, shortening and cream (if using) together gently in the microwave. Stop and stir at 30 second increments, till melted and smooth. Put dollops of ganache over filling and spread gently. Return to refrigerator to set topping.